Bringing together the world’s foremost experts on on-line terrorism activity is never an easy task. Hacktivism and arts organisation Disruption Network Lab had to accomodate a security detail of several German policeman its Terror Feeds conference. We could not enter some sessions without having our bags checked. The attendeed were constantly being watched by guards. The two rainy conference days in Berlin drew some 200 participants from universities, research institutes and law enforcement from around the globe, including Charlie Winter of the International Centre for the Study of Radicalisation (ICRS) in London, Aaron Y. Zelin of research website Jihadology and Belgian researcher Pieter Van Ostaeyen of KU Leuven. Propaganda has always been one of the core activities of IS. Right from the start, the group’s communications were aimed at stirring up a wave of disgust and fear. In Berlin, researcher Aymenn Jawad al-Tamimi of the Middle East Forum told us of the thousands of official administrative documents of the Islamic State he was able to collect, which allowed him to make one of the most detailed mappings of the group to date. Via a businessman he came to know in the Syrian town of Manbij, al-Tamimi found a booklet titled ‘Principles in the administration of the Islamic State. The document described how the Islamic State was to be governed, how it would work administratively and how things like recruitment would be regulated. The booklet also provided for the foundation of a set of central media organisations for the purposes of propaganda. ‘The document was no big master plan about how the Islamic State is structured, but it did show that media operations were baked into the organisation from the beginning’, says al-Tamimi. From those beginnings in 2013 and 2014, ISIS developed a central organisation structure comprises a media council that reports directly to its leader Abu Bakr Al-Baghdadi. ISIS also has an official spokesperson position in senior leadership. The most notorious of these was Taha Subhi Falaha, also known under his nom de guerre Abu Muhammad al-Adnani. Al-Adnani ’s audio was issued through the usual internet channels on 29 June 2014 and he brought out several other messages later. He was the one who, in the same year, called on potential terrorists worldwide to attack civilians in the West by any means possible, including low tech methods like knife and vehicle attacks. That particular message was followed almost to the letter by dozens of radicalised young people committed terrorist attacks in Europe and the United States. We started analysing around 50 profiles of perpetrators of terrorist attacks in Western countries, from the Boston Marathon bombing in 2013 to the vehicle attack on pedestrians and cyclists in New York in October 2017. Time and again we found that perpetrators of such attacks had consumed ISIS propaganda, including al-Adnani’s speech, or issues of the Dabiq and Rumiyah magazines containing ‘manuals’ for killing civilians. Al-Adnani was killed himself in an airstrike in August 2016. But he left a professional propaganda machine behind which even today is inciting people to randomly commit mass murder. The audio and video messages from ISIS’ leadership are traditionally published via al-Furqan. That agency was already in operation in the days of Islamic State in Iraq and has traditionally been the main outlet for the big messages of the leadership of ISIS. In addition, there are a number of other central media outlets like Al-Hayat Media Centre, which is known for its sleek video productions, including the extremely violent videos showing beheadings and executions, including the one of American journalist James Foley. ISIS also runs a number of other central media organizations, such as the weekly al-Naba newspaper, the al-Bayan radio station, a media section that produces anasheed, islamist songs that often accompany the video and audio content. In addition to these central media outlets, ISIS operated several media outlets in its provinces or wilayat, which offered more localised content from regions in Iraq and Syria, and from other parts of the world where terrorist cells are operating under the guise of ISIS, such as the IS factions in Libya and Egypt, Boko Haram in Nigeria and terror groups in territories further afield such as Afghanistan and the Philippines. Another key instrument in ISIS’ propaganda is the Amaq News Agency, a ‘non-official’ news outlet founded by Syrian ISIS sympathizer and self-declared journalist Baraa Kadek, who has since been killed in a US airstrike. Amaq came to prominence in Western media for publishing claims of terrorist attacks, including the Paris, Brussels and Nice attacks in 2015 and 2016. Amaq tries to emulate the style and tone of a proper news media agency and publishes a lot of battlefield accounts and other ‘news items’, presented as factual information. It also avoids use of demeaning terminology to describe enemies or ‘non-believers’, which is much more pervasive in the core propaganda outlets of IS. In Berlin, Charlie Winter presented research showing that at its peak in August 2015, ISIS churned out some 900 pieces of propaganda a week. In the early period after the “caliphate” declaration, ISIS mainly used Twitter as a means of spreading its propaganda over the world. Social media allowed ISIS to get a lot of coverage, in large part thanks to some very technology savvy ISIS members running the official ISIS Twitter accounts and other outlets, and an army of so-called “ISIS fanboys”. Social media allowed ISIS to get a lot of coverage, in large part thanks to some very technology savvy ISIS members running the official ISIS Twitter accounts and other outlets, and an army of so-called ‘ISIS fanboys’ who helped copy and spread the videos, audio messages, magazines, anasheed hymns and other propaganda materials. Other platforms like Google-owned Youtube and social media market leader Facebook were used as well. Jihadists never used them to the full, however, because they required much more detailed identification to create accounts. This made it harder for them to keep a flow of neww accounts going in case accounts were suspended, because it made creating new accounts more cumbersome. To get an insider’s view of ISIS’ propaganda machine, one of our producers tracked down a former ISIS member willing to talk. We headed to Istanbul, to one of the city’s densely packed neighbourhoods, and spoke to the young man for about an hour in a quiet little back room. Bird joined ISIS at the peak of its territorial expansion in Iraq and Syria. He was active as a fanboy, spreading ISIS propaganda on Facebook. He was soon contacted by an ISIS operative on-line and eventually made the journey to the self-styled caliphate where he, according to his own account, served as a soldier and was promised a position as a propaganda operative. Bird was lured to travelling to the so-called caliphate because his handlers feared his prolific on-line campaigning would eventually put him at risk of discovery. The Internet Protocol number of the devices he used might have given his location away. But, more importantly, Bird’s story shows how important waging ‘media war’ is for ISIS. He started sharing ISIS content on social media out of frustration with the crackdown on Muslim Brotherhood protesters in Egypt during the revolution and the Rabaa sit-in massacre in 2013, when hundreds of supporters of ousted Muslim Brotherhood president Mohamed Morsi were gunned down during protests in Cairo. Bird grabs his phone and shows shocking footage. A chaotic scene in front of a red garage shutter, maybe a storefront. On the footage, policemen in battle dress are seen inside the building, a woman appears and puts her hijab back on and is being pushed around, apparently after having been assaulted by the policemen and others inside. She gets pushed outside, through the gate, and is beaten by several men outside the gate. Other women try to help her and get kicked and trampled on too. The women plough themselves through the crowd, away from the fight. The footage does not show whether or not they escape the attackers. Bird soon got some traction on his social media accounts. He was then contacted by ISIS operatives on-line and got direct guidance on how to maximize the spread by creating new accounts every time an account is suspended. ‘All the outlets, like al-Furqan or Amaq have alternative channels of distribution as well’, says Bird. The branding of the propaganda is also strictly controlled by on-line operatives and each social media operative is enlisted with a specific media division of ISIS. The Bird also shed some light on how ISIS operated its media inside territory under its control. New arrivals are strictly handled and have to hand in their mobile phones. Many get media training. Bird was forced to participate in a few battles. There, he saw first hand how the media machine works. Bird eventually got frustrated with ISIS because he did not get the position of media operative which was promised to him when he made his hijra, his emigration to the territorry of the self-styled ‘caliphate.’ He eventually left ISIS, risking his life in the process, as ISIS usually brutally cracks down on and kills those who are no longer loyal to the organisation. 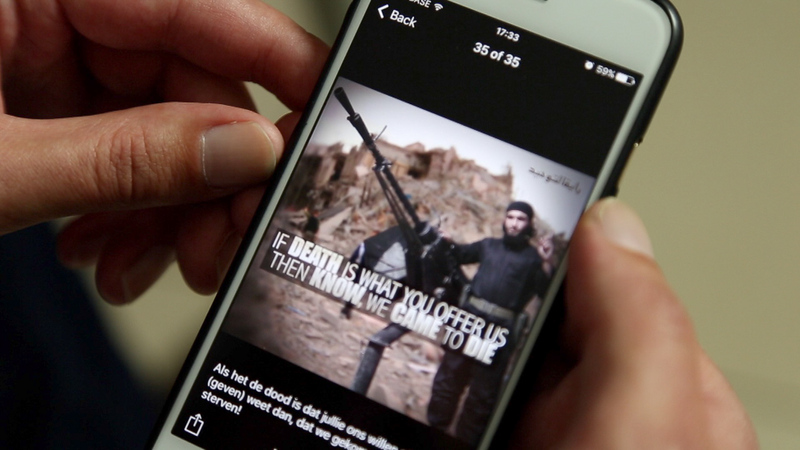 The deaths of ‘traitors’ are often prominently featured in ISIS’ video content. Bird also points to the ‘false promises’ that were made to him as yet another way in which ISIS distorts reality for propaganda purposes. Through our own on-line research we found propaganda calling for media professionals to join the “caliphate”. Some clips show almost surreal scenes of a behind-the-camera director telling fighters how to stand and speak as the prepare to deliver a statement for a propaganda film. Evidence emerging slowly from the dwindling “caliphate” seems to prove that the major battle and execution videos were shot in territory where ISIS can freely operate. Editing, post-production and dissemination seems to be a far less centralised affair, and may be done all over the world. Many fighters also take cameras into battle. Bird spoke of children being sent into fighting areas as ‘scouts’, using mobile phones to film footage that may later end up in propaganda. ‘We cannot know for sure where, when and by whom these videos are made, but we can deduct a lot from the way it was shot, and the locations that were used’, says researcher Pieter Nanninga. There is also evidence, among other originating from former IS fighters like Bird, that ISIS propaganda operatives had a high status in the so-called caliphate, often earning far higher salaries than ordinary ‘grunts’ fighting ISIS’ wars, usually to be sacrificed in an endless barrage of suicide attacks in Iraq and Syria. ISIS also spent a lot of money on propaganda. One document acquired by al-Tamimi showed that one month, IS spent 155,000 dollars on media in Deir Ezzor alone. Further documentation shows how different departments of ISIS would call in media operatives to cover their activities. ‘Many of the videos are of very high quality and look like Hollywood productions’, says Pieter Van Ostaeyen. With most of its territory in Iraq and Syria now gone, it has also become evident that ISIS used its propaganda inside the “caliphate” to install a regime of terror and to brutally squash any opposition that may have arisen in its territory. Syrian opposition media group Raqqa is being slaughtered silently (RBSS) documented these practices in great detail and tried to counter some of the narratives being imposed on local populations in ISIS-controlles areas, like ISIS’ Syrian ‘capital’ Raqqa. RBSS ran a small network of activists to counter those narratives inside ISIS-held Raqqa with media and hacking activities. They spreadfake versions of ISIS magazines, with the same cover so people could read them without causing suspicion. RBSS also carried out graffiti actions and they waged hacking wars with IS operatives. It was extremely dangerous work. Some of the main activists, including family members of Alhamza, got caught and were brutally executed. Some of those executions were made into propaganda videos by ISIS. It remains very difficult to gauge exactly how big the world wide support base of ISIS and Al-Qaeda is. Attemps at making a tally based on social media use and propaganda yielded variable results, often with large margins of error. In our year of research, our team read through some 150 books, reserach reports, articles and other academic sources on the ‘cyber-jihad’. We found most results inconclusive. One thing did emerge from all the materials: the group of jihadi propagandists is probably very small, but extremely good at social media. One often quoted report was a Twitter census of jihadi content by American think-tank Brookings Institution and Google in 2015, when ISIS was at the height of its influence. The researchers concluded that there were some 46,000 active ISIS-supporting accounts on the micro-blog website at that time. ‘Much of ISIS’s social media success can be attributed to a relatively small group of hyperactive users, numbering between 500 and 2,000 accounts, which tweet in concentrated bursts of high volume’, according to Brookings. The Brookings census also showed that most of the propaganda was disseminated and consumed in the Arabic world. Three quarters of the content was posted trough Arabic Twitter accounts, with about a quarter on English speaking acounts, and smaller percentages in other languages. Our own undercover research also showed that pattern of geographic distribution. Many fanboys were heavily involved in translations of propaganda, which is a common practice. Pieter Van Ostaeyen recalls being contacted at times by some of his on-line contacts to request translations. Since the heyday of the “caliphate” in 2014 and 2015, twitter has cracked down heavily on jihadi accounts. Thousands of ISIS and Al-Qaeda profiles were removed, and Facebook and YouTube / Google startde cracking down as well, which pushed IS-supporters to other platforms. These days Telegram, a heavily encrypted messaging app developed by Russian tech entrepreneur Pavel Durov, still offers a largely unpoliced space wher jihadists can operate relatively freely. Our year of undercover research also showed that this game of whack-a-mole between jihadists and internet companies is far from over. It remains exceedingly easy to get an anonymous SIM card somewhere and to use a smartphone to create a whole series of accounts and look for jihadis on Telegram, Paltalk and so many other platforms. It is simply impossible to gauge the size of this problem. ‘If one platform cracks down, they will simply move to another.’, says Pieter Nanninga. ‘Measures taken by large platforms like Twitter certainly had an effect, and the fact that a lot of jihadis are now on Telegram has diminished their reach compared to 2014 and 2015. Yet IS and other terrorist groups keep popping up in headlines of news media. The propaganda never seems to miss its intended effect. Even now, with production of video’s and on-line magazines drastically reduced and the number of propagandists diminished by miltary actions agains IS and other groups, which killed several prominent propaganda operatives. This report was produced with support of the Fonds Pascal Decroos voor Bijzondere Journalistiek.